With New Jersey Gov. 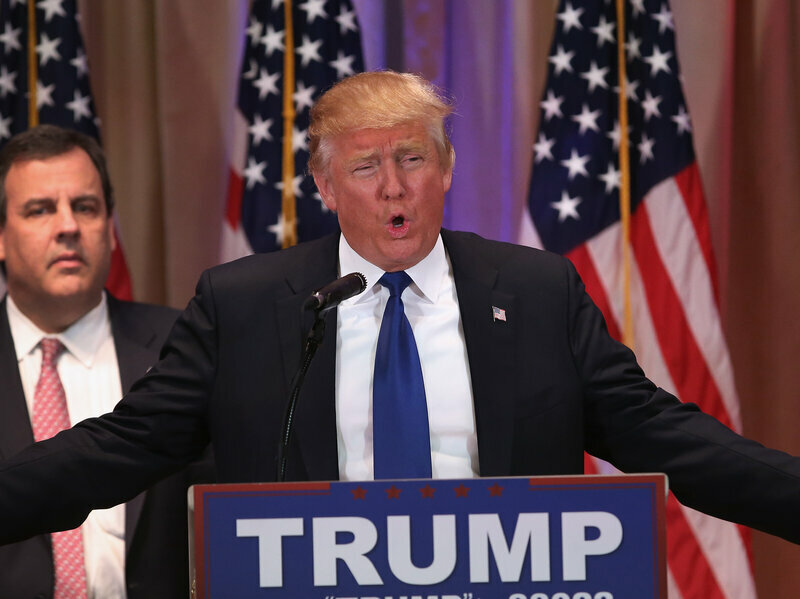 Chris Christie at his side, Republican presidential front-runner Donald Trump speaks to the media in Palm Beach, Fla., on Tuesday. It&apos;s the biggest voting night yet this year: Voters went to the polls and caucus sites in 13 states Tuesday, with 1,460 delegates at stake. And while results are still coming in, it&apos;s already clear: It&apos;s a great night for Hillary Clinton and Donald Trump. Even across the wide array of states — diverse and not, high-income and low-income, ideological and moderate — there are a few big trends that explain the results. Which groups supported Trump? All sorts of them. He turned in solid performances in many Super Tuesday states among men, women, old, young, rich, poor. Even in the areas where he was weaker, he tended to still be strong. Trump performed more poorly among college grads than he did among high school grads, for example. In the nine states for which there are polling data available, he led by anywhere from 6 points to 48 points among high school grads. Among college grads, things were much closer. But when he lost, he never lost by much — among the first states to report their polls, the most he lost college grads by was 12 points (in Texas). And he led the next closest contender by 17 points among college grads, in Massachusetts. One of his few, glaring weaknesses: Tonight, as in past contests, he did poorly among voters who want a candidate who "shares my values." However, he tends to make up for that by dominating among voters who want someone who "tells it like it is," and he is also strong among those who want a candidate who can "bring change." One other key point about Trump&apos;s support: It&apos;s solid. He had heavy support among voters who decided whom to vote for more than a few days ago. Ted Cruz and Marco Rubio (and in a couple of cases, John Kasich) tended to split the vote among the last-minute deciders. There weren&apos;t a lot of polling surprises on the Democratic side: As in prior contests, Clinton&apos;s big strengths were nonwhite and older voters, as well as women. Sanders was strong among young, white and male voters. In the nine states&apos; exit polls, between 84 and 95 percent of Republicans said they were "dissatisfied" or "angry" with the federal government. Though Trump didn&apos;t win this group in all of those states, he was always strong with them. These data (courtesy of ABC News) really sum up the night: In early exit polls (that is, as of 7 p.m. ET), 84 percent of Democratic voters said they wanted a candidate with experience, and 14 percent said they wanted an outsider. Meanwhile, 40 percent of Republican voters wanted experience, compared with 50 percent who wanted an outsider. That trend bore out across states — across the first nine Democratic contests, 74 to 86 percent of voters wanted a candidate who had experience. On the GOP side, it was only 34 to 46 percent. And though Sanders is by no means inexperienced in politics, Clinton is the clear choice of Democratic voters who prioritize experience. Trump, meanwhile, is the quintessential outsider. Given this stat, it&apos;s not at all a surprise that Clinton and Trump had such strong nights.